Mangaluru, Dec 26, 2014: The journey time between Mangaluru and Udupi has only got extended by the ‘Express’ bus services over the years, from about 60-70 minutes a few years ago to 80-90 minutes now. This is despite there being stiff competition among bus operators as well as advances in technology. Buses take at least an hour and a half to cover the distance of about 60 km. They stop every five-seven kilometres to pick up passengers, thereby consuming more time. The crew, eager to get as many passengers as possible, stop the bus whenever passengers flag it down near these halts. According to Jathindra Maravanthe, a financial services advisor based at Byndoor, it was the regional transport authority (RTA) that fixes the routes and timings. There are a whole lot of timekeepers along the route, who are paid by the consortium of owners. The bus was therefore destined to use as much time as permitted, he said. The prime reason for ‘express’ services becoming somewhat akin to ‘shuttle’ services, according to bus operators, is the increase in the number of halts en route due to public demand. “Everyone on the stretch wants the Express service to stop at their place,” said Rajavarma Ballal, president of Canara Bus Owners Association. He said, earlier there were only three stops on the route — Surathkal, Mulki and Padubidri. However, RTAs of Dakshina Kannada and Udupi have got the number of halts increased to at least 11 over the years because of public demand. There is little difference between Express and Shuttle services these days, Mr. Ballal said. And now there was a growing demand for another halt at Haleyangadi, between NIT-K and Mulki, he said. Similarly, the number of halts between Udupi and Kundapura too increased from three — Brahmavara, Saligrama and Kota — to at least 10. During successive meetings of RTAs, bus owners have constantly been opposing the move to provide more halts for Express services for two reasons — increase in the travel time and the impact on the revenue of shuttle service operators. 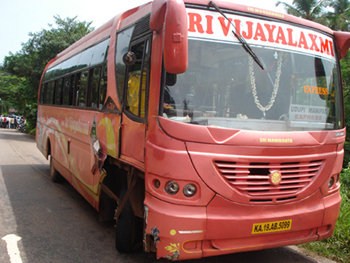 The number of shuttle buses between Mangaluru and Udupi has come down just to three or four from more than 30 over the years, an operator had told the recent RTA meeting in Mangaluru.